Last time I wrote I had just been to the dermatologist and was having doubts about what to do and where things were going. Sitting here now, that seems like half a year ago not just over a month ago. I stopped seeing the Ayurvedic doctor as I realised there wasn’t much the diet or the supplements were doing other than keeping me regular and I could find cheaper ways to make sure of that. I took the anti-fungals from the derm which helped the rash under my arm. I also tried borax under my arms to really hit the rash hard and in two days it was gone. That was pretty amazing and I recommend giving it a go if you’re looking to get rid of a fungal rash like athlete’s foot or something of that nature. Would use less under my arms next time though as it’s a sensitive area and peeled quite a lot of the next few days. Anyway, about halfway through month three I went to Perth to visit my brother and his family and celebrate my nephew’s 2nd birthday. It had been planned for months and I was feeling like I could handle it even though I knew the full TSW hell was yet to come. It was a 4-hour flight to Perth on the cheapest airline, packed in tight and I started feeling a little down. My neck had been oozing and as soon as I got on the plane, I dried out completely with my neck oozing away. Over the next few days I shed like nothing else but did my best to have a normal holiday, drank some beers and wine, got a lot of sun and fresh air, and ate whatever I wanted. I was also trying to get as much sun as possible but I don’t think I was ready for it as I was just still in the flare and burn stage. I was trying to feel good and put on a brave face but getting anxious about not having ACV and my routine was way out of wack. Looking back, I was just about to hit the worst period so far. At the end of the four days I started getting intense chills, fever like shakes basically that nobody else was feeling (these chills lasted over a month by the way). I was getting pretty sick but just trying to cope by taking hot baths. My insomnia was also insane which was adding to the stress. They had a cat living indoors too – I’ve been in denial about having cat allergies forever but this confirmed it. I was getting pretty sick. I came back to Melbourne and had crazy headaches on the plane and while I was due to go back to work the next day after getting in at about 10pm, I realised I wasn’t well. I was burning up but freezing cold, and started getting a rash on my neck and face. I woke up the next day to a horrific sight – swollen, insane flaking and a terrible infection. My neck was split in several places and I was freaking out. I called a few hospitals but in the end decided to go to the local doctor to get it checked. The doc listened but in the end said it was a bacterial infection and gave me antibiotics and encouraged me to use steroid cream and tablets to get the inflammation down. He obviously didn’t listen too well as I told him about my TSW journey. I took the antibiotics and the next day decided to go back to see him this time with my dad as support to see if he could do a skin biopsy to make sure that it wasn’t viral (eczema herpeticum for example) as I’d seen quite a few cases of this in people with TSW. He actually got really short with me and didn’t do the biopsy as he was confident it was bacterial. He did refer me to get my blood checked and adrenal function checked and gave me some heavy sleeping aides though. That afternoon I went for a second opinion with another clinic and they were shocked by my condition, did a skin biopsy (which turned out to be a bacterial infection – first guy was right!) and long story short, while they didn’t really agree with TSW told me that they’d stick with me throughout the journey. That was the first support I had felt – even though they still thought I was crazy! Got my blood work back and IgE was off the charts, allergies confirmed to rye grass, cat and dog hair and dustmites. Ow yeah. 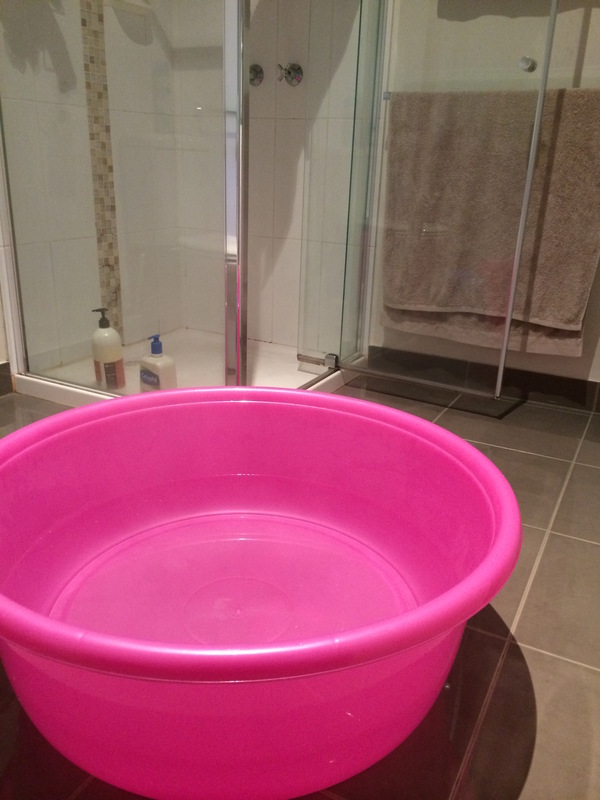 Oh yeah, no bath in my apartment so I decided to buy a big bucket! Best $22.95 I’ve ever spent! For real – if you don’t have a bath get a bucket! It will change your life! I ended up taking a week off work to get over the infection but it finally subsided. It took another month to get over the main symptoms and I’m still not completely over it two months later. Anyway, more about month four shortly!